Opening times vary. Check the opening hours for each shop using the links above. 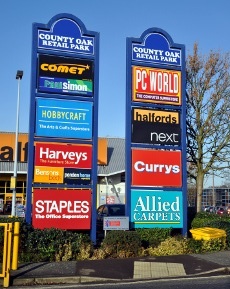 County Oak Retail Park is just off the A23 (London Road) in Manor Royal, on the northern end of Crawley just south of Gatwick Airport. There is a large car park. Parking is for customers only, and is limited to two hours. The lanes within the car park are narrow. Watch out for the yellow metal gate posts that stand in the road at the entrance.